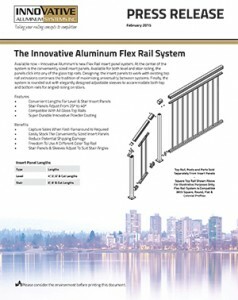 Innovative Flex Rail insert panel system – Innovative Aluminum Systems Inc.
We’re happy to present you with the official press release for our newest innovation – The Innovative Flex Rail System. This picket insert panel system provides you with a versatile, yet rigidly constructed solution in a simple to order program. It’s easy to stock, and retains much of the cross-system-compatibility you’ve grown to expect from Innovative Aluminum Systems Incorporated. Please click below to view and save the press release!